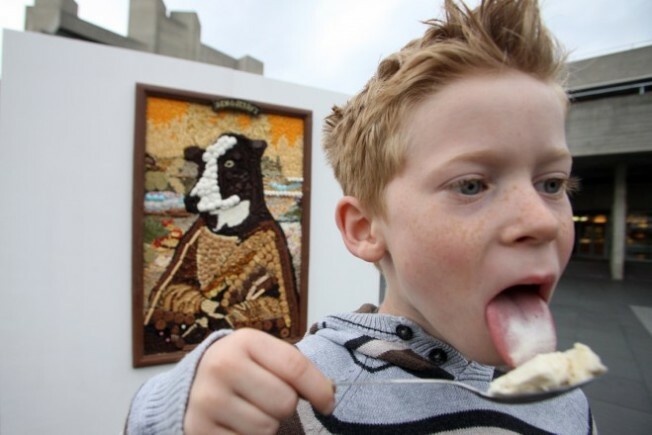 Oh, we wish we could have been there for the recent unveiling of the "Moona Lisa" in London, an ice-creamy-cookiefied portrait of a cow containing lots and lots of Ben & Jerry's deliciousness. Did we mention this "painting" was lickable, too? Try that in a real museum. Wait, don't. We were joshing. Honest. But since we didn't get our licks in with the Moona Lisa, we're looking forward to the next best thing: Free Cone Day at Ben & Jerry's shops on Tuesday, April 21. We're pretty sure that Vermont's most famous ice-cream-a-torium doesn't control the weather, but no matter the forecast, free ice cream ought to get you moving. There are Scoop Shops in all across the country doling out sweet cream today. Check out this list and see where there's one near you.